I took a close look at HP’s WebOS TouchPad tablet during Mobile World Congress in Barcelona. This 9.7” machine looks delightful. One of its features is wireless charging using the optional Touchstone accessory. The same technology can also transmit data, as mentioned in this post on wireless charging, and the TouchPad makes use of this in conjunction with new WebOS smartphones such as the Pre3 and the Veer. Put one of these devices next to a TouchPad and the smartphone automatically navigates to the same URL that is displayed on the TouchPad. A gimmick, but a clever one. From what I saw though, these WebOS devices are fast and smooth, with strong multitasking and a pleasant user interface. Wireless charging is excellent, and a feature you would expect Apple to adopt before long since it reduces clutter. I still would not bet on HP winning big market share with WebOS. The original Palm Pre was released to rave reviews but disappointing sales, and HP will have to work a miracle to avoid the same fate. HP will not do Android or Windows Phone 7 smartphones – but what chance for webOS? We will not do a Linux, Android phone. We won’t do a Microsoft Phone … we’ll deliver webOS phones. I will be interested to see if HP sticks to this commitment. HP is Microsoft’s biggest customer and huge in business systems, but that does not necessarily mean it can make a success of a mobile platform on its own. Mobile platforms stand (or fall) on several pillars: hardware, software, mobile operator partners, and apps. Apple is powering ahead with all of these. Google Android is as well, and has become the obvious choice for vendors (other than HP) who want to ride the wave of a successful platform. Windows Phone 7 faces obvious challenges, but at least in theory Microsoft can make it work though integration with Windows and by offering developers a familiar set of tools, as I’ve noted here. RIM Blackberry is well entrenched in the Enterprise and succeeds by focusing on messaging and doing it well. Nokia and Intel will jostle for position with MeeGo. It is obvious that not all these platforms can succeed. If we accept that Apple and Android will occupy the top two rungs of the ladder when it comes to attracting app developers, that means HP webOS cannot do better than third; and I’d speculate that it will be some way lower down than that. You have to feel for HP, which has supported Microsoft’s failing mobile platform for many years – with the occasional lapse, remember when it became an OEM vendor for Apple’s iPods? – and now has decided it cannot rely on the company in this area. That is understandable. However, HP is heavily invested in Windows. It may be choosing just the wrong moment to abandon ship; or it may find that doing its own thing with webOS is no better. Google Android would have been a safer though less interesting choice. Flash and AIR for Windows Phone 7 by mid 2011? I’m at an Adobe partner conference in Amsterdam – not for the partner sessions, but to be one of the judges for tomorrow’s application showcase. However, I’ve been chatting to Michael Chaize, a Flash Platform evangelist based in Paris, and picked up a few updates on the progress of Flash and AIR on mobile devices. AIR is a runtime which uses the Flash player for applications that are not hosted in the browser. It’s well known that AIR for Android is ready to preview, though it is not quite public yet. Which platforms will come next? According to Chaize, AIR for Palm webOS is well advanced, though a little disrupted by the coming HP takeover, and Blackberry is also progressing fast. He added that Windows Phone 7 will not be long delayed, which intrigued me since that platform itself is not yet done. Although Microsoft and Adobe have said that Flash will not be in the initial release, Chaize says that it will come “within months” afterwards, where “months” implies less than a year – maybe six months or so. We also talked about the constraints of a mobile platform and how that affects development. Currently developers will need to use the standard Flex components, but Chaize said that a forthcoming Flash Mobile Framework will be optimized for devices. Of course, the more you tailor your app for mobile, the less code you can share with your desktop version. The Apple question also came up, as you would expect. Chaize pointed out that Adobe’s enterprise customers may still use the abandoned Flash Packager, which compiles Flash code to a native iPhone app, since internal apps do not need App Store approval. That said, I suspect that even internal developers have to agree the iPhone Developer Program License Agreement, with its notorious clause 3.3.1 that forbids use of an “intermediary translation or compatibility layer or tool”. Even if that is the case, I doubt that Apple would pursue the developers of private, custom applications. HP intends to continue selling Windows-based devices. "We believe in choice," Bradley said. But it sees a brighter future in offering Windows phones and tablets alongside systems based on webOS, which debuted earlier this year on the Palm Pre. "With Palm, HP acquires a strong operating system to deliver a unique customer experience," Bradley said. It’s a mixed message, which means it is hard to articulate, and hard to make it work. Nor it is the first time HP has wavered over Windows for mobile devices. Remember when HP rebadged the iPod, back in 2004? It was a short-lived experiment, to nobody’s surprise. This deal makes more sense than becoming an Apple OEM, but it will still be hard for HP to pull off. The other surprise, also mobile related? Apple no longer lovers Mac developers. There are three possibilities that come to mind. One is that all the platforms will eventually allow you to write in C or C++, making this the unifying language, though you still have some fancy footwork to do overcoming library differences. Android now allows this via the NDK, and Palm via the PDK. There is currently no alternative to Java for Blackberry, and Microsoft says native code won’t be possible on Windows Phone 7, but well, you never know. The second is Adobe Flash. This is an interesting one, because Apple prohibits Flash on the iPhone, but Adobe has a Packager for iPhone that builds native iPhone apps from Flash projects. Another issue is that although Flash is available or promised for all the main non-Apple devices – Apple’s gift of a selling point to its rivals – it is not Flash alone that does what it needed, but AIR, the “desktop” or out-of-browser runtime. This has been previewed for Android and promised for other devices including Blackberry. AIR for Windows Phone 7? Maybe, though I’ve not seen it mentioned. A third idea is a clever framework that does the necessary cross-compilation under the covers. This cannot depend on deploying a runtime, nor compiling to native code, because these approaches are blocked by some mobile platforms. Rhomobile has the Rhodes framework, where you code your app in HTML and Ruby and compile for devices including iPhone, Windows Mobile, RIM Blackberry, Symbian, and Android. Rhodes includes an MVC (Model View Controller) framework and an ORM (Object Relational Mapper) to wrap database access. There is also a RhoSync server component to enable offline data with synchronisation back to the server when reconnected; and the RhoHub hosted IDE for buildings apps with a web browser. Rhomobile tells me that Palm WebOS support is in the works. They also promise Windows Phone 7 support, which intrigued me because Rhodes says it compiles to “true native device applications”. Has Rhomobile gotten round Microsoft’s opposition to native code? Apparently not; VP Rob McMillen eventually told me that this will mean a .NET IL (intermediate language) implementation. 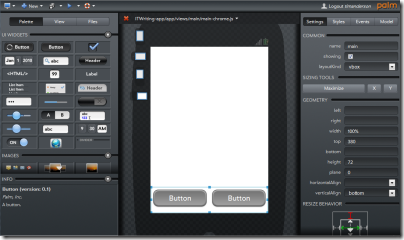 The Rhomobile approach reminds me of AppForge, a company which produced the well-regarded Crossfire add-on for Visual Studio and compiled Visual Basic to a wide variety of mobile platforms. Unfortunately AppForge was acquired by Oracle, and its new owners showed callous disregard for existing customers. Not only did development cease; it also became impossible to renew existing licenses. Thanks to an activation component, that also blocked new deployment of existing applications – every developer’s nightmare. That said, there is no activation requirement for Rhodes that I know of, and the framework is open source, so I don’t mean to suggest it will suffer a similar fate. What about Java? On the face of it, Java should be ideal, since multi-device support is what it was designed for. It is a measure of how far Java has fallen that we hear far more about the lack of Flash on the iPhone, than the lack of Java. Microsoft says yes to Flash on Windows Phone 7, though not on first release, but nothing about Java. Java as a mobile runtime needs a strong dose of lobbying and evangelism from its new stewards Oracle if it is not to fall by the wayside in this context. Hmm, AppForge. I spent a few minutes trying out Ares, Palm’s web-based IDE for WebOS, the OS used in the Palm Pre smartphone. Ares is in public beta and I’m not going to pretend I found it smooth going. No doubt it will be fine after a little patient learning. 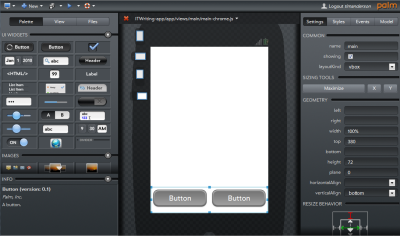 It is amazing, with drag-and-drop visual interface builder, code editor, source code management, debugger, and logging. Microsoft’s Internet Explorer is not supported in any version; you need Mozilla Firefox 3.5 or higher, Apple Safari 4.0 or higher, or Google Chrome 3 or higher. In order to try Ares, you have to sign up for Palm Developer Center. As part of the process, it appears that you have to give Palm permission to charge fees to your PayPal account, which I disliked, though membership is free for the time being. Of course you hope that any fees will be more than offset by the steady chink-chink of income from your app sales. Is this the future? My immediate reaction was to be very impressed; a little further in and I was greatly missing the comfort of Eclipse. Still, this stuff will get better; and the idea of just browsing to an URL to continue development is compelling.